Last week, researchers released the first-ever geological map of Ganymede, Jupiter’s largest moon and the largest planetary satellite in the Solar System. Led by Geoffrey Collins of Wheaton College, these scientists produced the first global geologic map that combines the best images obtained by NASA’s Voyager 1 and 2 spacecraft (1979) and the Galileo orbiter (1995 to 2003). The information of these probes was pieced together as a mosaic image of the planet, giving us our first complete image of the geological features of the world. 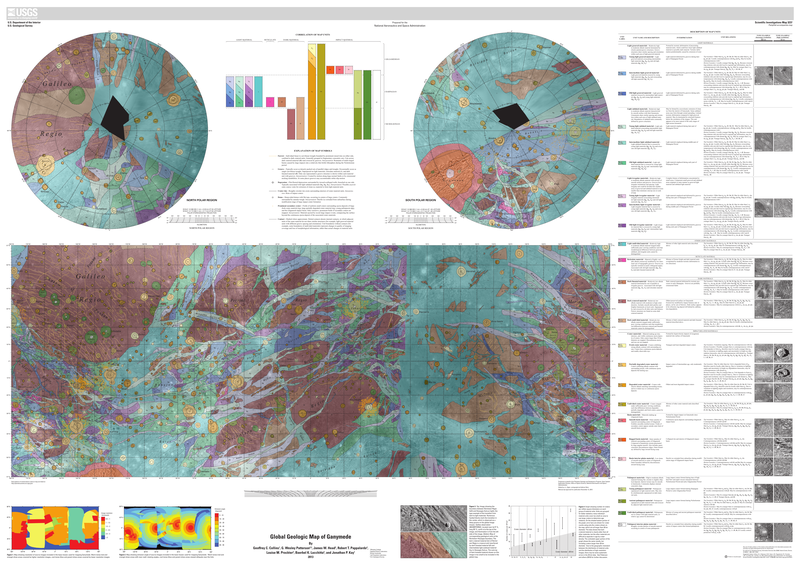 This image has now been published by the U. S. Geological Survey as a global planar map. The 2D version of the planet surface illustrates the varied geologic character of Ganymede and is the first global, geologic map of the icy, outer-planet moon. This map illustrates the incredible variety of geological features on Ganymede and helps to make order from the apparent chaos of its complex surface. This map is helping planetary scientists to decipher the evolution of this icy world and will aid in upcoming spacecraft observations. Since its discovery in January 1610 by Galileo Galilee, Ganymede has been the focus of repeated observation; first by Earth-based telescopes, and later by the flybys and orbiting spacecraft. These studies depict a complex, icy world whose surface is characterized by the striking contrast between the dark, very old, highly cratered regions, and the lighter, somewhat younger regions marked with an extensive array of grooves and ridges. The map isn’t just aesthetically pleasing; it also informs our understanding of Ganymede’s geological history. Researchers have identified three geological periods – one involving heavy impact cratering, followed by tectonic upheaval, and then a decline in geological activity. The more detailed images let them study the ridges and groves, and have revealed that the formation of cryovolcanos is rare on Ganymede. 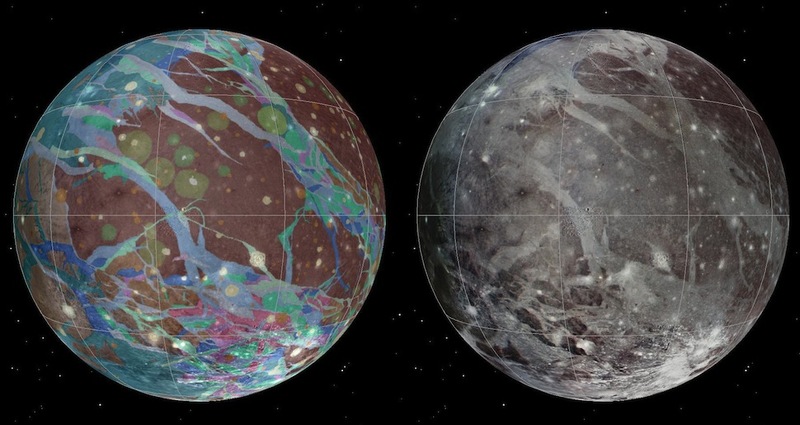 The highly detailed, colorful map confirmed a number of outstanding scientific hypotheses regarding Ganymede’s geologic history, and also disproved others. For example, the more detailed Galileo images showed that cryovolcanism, or the creation of volcanoes that erupt water and ice, is very rare on Ganymede. According to the Jet Propulsion Laboratory, Ganymede is an especially valuable body to study because it is an ice moon with a richly varied geology and a surface area that is more than half as large as all the land area on Earth. 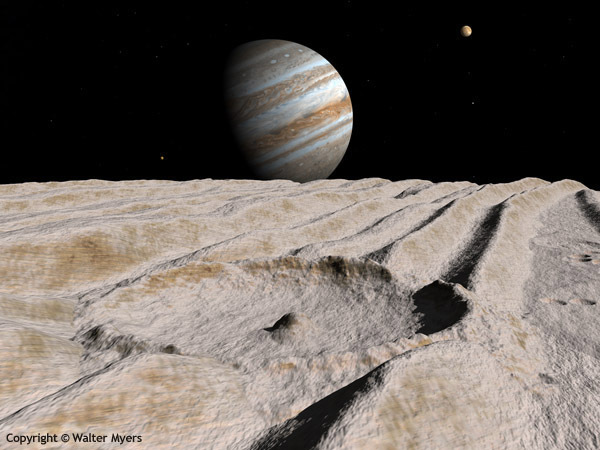 The Ganymede map will also enable researchers to compare the geologic characters of other icy satellite moons, since most features found on other icy satellites have a similar feature somewhere on Ganymede. After Mars, the interiors of icy satellites of Jupiter are considered the best candidates for habitable environments for life in our solar system. This geologic map will be the basis for many decisions by NASA and partners regarding future U.S. missions under consideration to explore these worlds. Papa Zulu – Ready and Available, Finally!